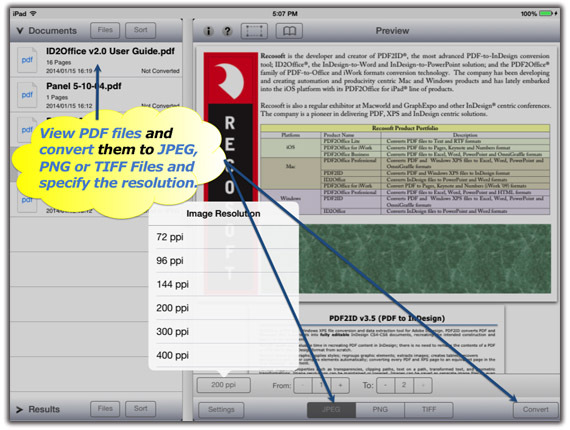 PDF Converters for iPad, converts PDFs to editable Word, Excel, PowerPoint, OmniGraffle, Pages, Numbers, Keynote, JPEG and PNG files. 1. 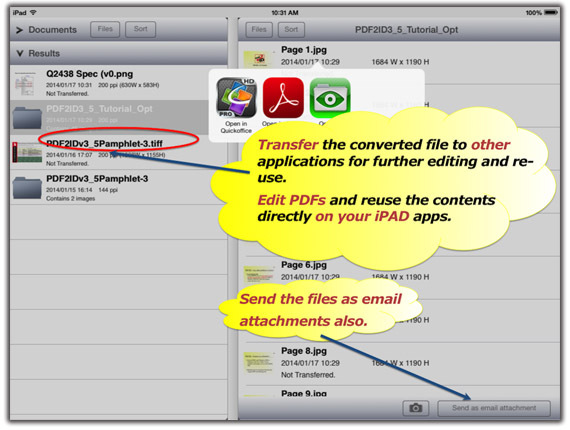 To Convert PDF files to JPEG, PNG or TIFF on the iPad you have to download the PDF to JPEG – PDF2Office app from the app store. 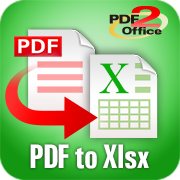 Then you add PDF files to the Documents list using the unified PDF viewing and conversion interface. 2. You can convert the PDF file entirely or simply use the Area select tool and mark just the area you want converted to JPG, PNG or TIFF formats. 4. You can than transfer the JPEG, PNG or TIFF images to other apps on the iPad or use the integrated File manager to upload JPEG, PNG and TIFF images to cloud drives.